My starting point is a photo I took of a sunflower field in Provence. The picture was cropped to only keep one of two flowers; then it was enlarged and I increased the contrasts before printing it in black and white. I also worked with the reversed image. Background fabrics : vintage hand-dyed linen and lace; for the flowers I used silk, light fusible interfacing and vliesofix; Hand-dyed thread for hand quilting, rayon and silk thread for the flowers. Markal paintsticks and freezer paper for stencilling. 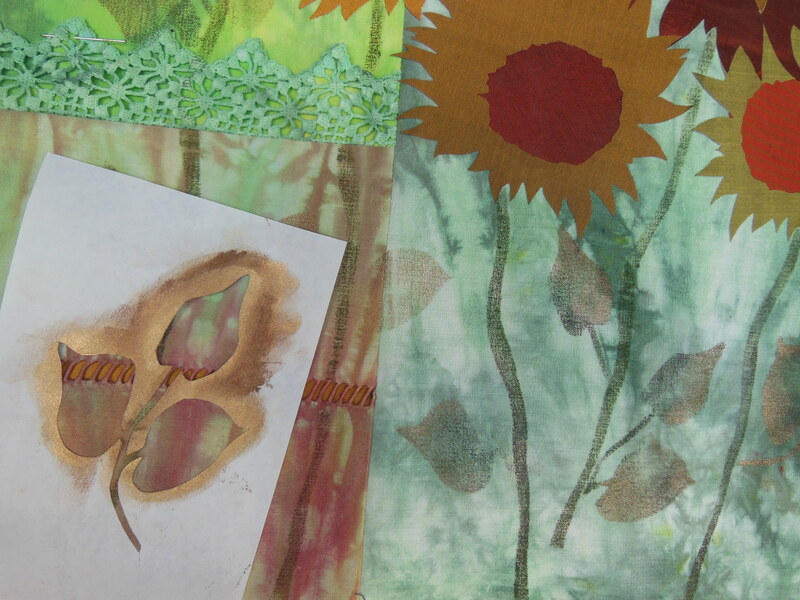 Technique : I have chosen silk for the sunflowers to make a contrast between the coarse texture of the background fabric and the delicate and shiny aspect of silk for the flowers. To stabilize the silk I have fused on the back a light interfacing; then the flowers were traced on the paper side of the vliesofix, cut out and fused in place. I traced my flowers on a quilting tracing paper to be more accurate when doing the free motion quilting. Some leaves were stencilled with paintsticks, I also added a little bit of paintstick on the flower petals. Hand quilting was added at the end following the motifs left by the dye on the fabric. Excellent choice of colour and attention to detail. There is always a delicacy in your work and this is constant throughout the series, lovely work and a great addition to a great series. This final piece of your series is so beautiful. Again and of course I would say! You created a marvelous series, the colors of each piece match perfectly. Chapeau! Chantal, the way you transformed a photo to a quilt is just amazing. I love the detailed work you put in this piece and your choice of fabrics, to give effects to the flowers. A beautiful series, each piece telling a story and the way you played with the colors. My compliments. Thank you for your warm comments … I had such a pleasure to make this one ! Chantal a delightful series and a strong design to end the series, your techniques have been something that I have followed through all the series. Bravo. Magnificent series. Your hand is clear throughout. I could select your works among many others at an exhibit. Lovely detail and work with color! Beautiful series, Chantal! I really enjoy seeing these lovely quilts and I love the colors and details. A lovely series which is beautifully designed and stitched. I love the colours you have used in this piece, which give a mellow feeling. I love the little lace insert, and the techniques you have used to bring detail to the piece. I love the vibrancy of this quilt. The pop of red petals is unexpected when thinking of sunflowers. Your voice has come through with each quilt, and the use of blue in all of them has helped to unify the series. Well done. What a wonderful way to end your beautiful series. I love the composition in your quilts and your use of color. This last one is so vibrant. You so much have developed youw own style that I always recognize it immediately. Bravo! 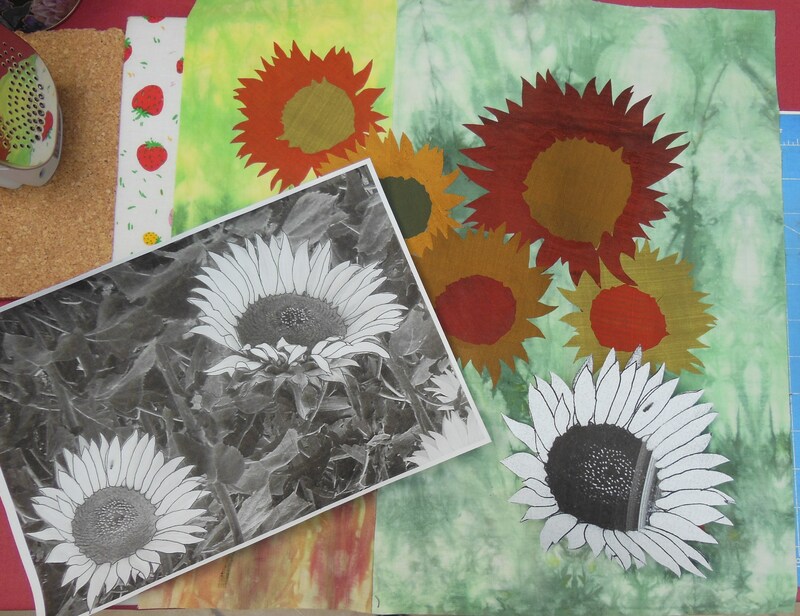 Beautiful, cheerful sunflowers with lots of details in the flowers and in the background? This is a lovely ending to your series. What a wonderful end to your series. The unexpected pop of color works well in unifying your series along with the delicate details, techniques and beautiful stitching. Well done.